These 1st birthday party ideas are a great way to make sure that celebrating this day is very special. Even though the birthday boy or girl won't remember it - it is very special to mom & dad!! Take lots of pictures to show them later! They make so many cute themed plates, invitations, etc. for 1st birthday parties now, but all that is necessary is your child, a camera, and a party planned at the best time of day when your child is at their best! Some people like to just have family (that is what we did - family, cake and presents). Others like to have a big affair with family and friends. Plan it for a time of day when baby will be at their best (and you too). The party doesn't need to be long...too long can be too much for baby. Have a camera ready, along with backup batteries. Make sure someone is in charge of taking the photos so you can concentrate on the baby. Maybe more than you need! If so, consider just letting everyone come and have a piece of cake, with no gifts necessary. Whatever you choose, enjoy it, and take lots of photos! Add your ideas or photos to our party ideas list! Games for Young Children - try some of these fun games at your party for your little guests. These children's party games are perfect for little ones who are ages 2 to 3 and up. 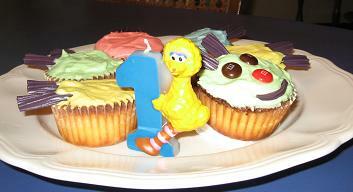 First Birthday Cakes - All children's birthday cakes are special, but the first birthday party cake is extra special! More Kid Party Ideas - Browse our complete list of Kid Party Ideas for the most themes you'll find anywhere!